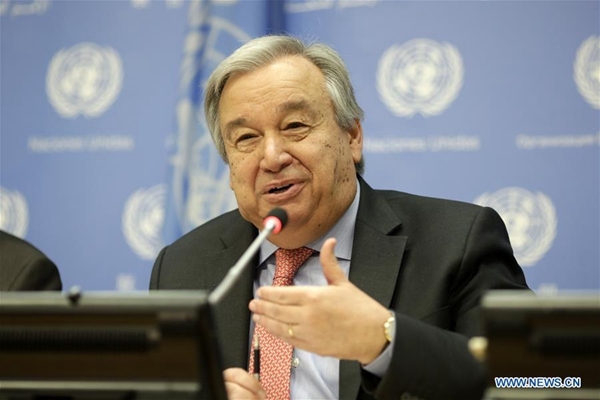 UN Secretary-General Antonio Guterres on Thursday stressed the importance of multilateralism and rules-based international relations in addressing global challenges. Asked how concerned he was about the assault, particularly from Washington, on the post-World War II order of which the United Nations is very much a part, Guterres said he was confident that the world will continue to recognize the world body as "an absolutely essential multilateral instrument" to support peace and security worldwide, and also as a pillar in relation to development and human rights. "It is my deep belief that the challenges we face are more and more global challenges, and only through multilateral governance and rules-based international system will we be able to respond to those," he said. The world cannot live without a multilateral system and rules-based set of international relations, he stressed. That does not mean that there is nothing to reform in the United Nations. But reforms should be organized to strengthen that capacity and to make it more effective in addressing the needs and aspirations of "we, the peoples (of the United Nations)," he said. On relations between the world body and the United States, he said there are areas where the two do not agree, but there are also areas where they engage and cooperate. "There are difficulties, there are problems, there are areas of disagreement, there are also areas of cooperation and agreement. That is what relations must be... When we disagree, we disagree; when we agree, we agree. Let's make sure that the points of disagreement do not disrupt the relations and let's seize the opportunities created by the points of agreement." ?UN Secretary-General stressed the importance of multilateralism and rules-based international relations.